To properly manage fluids subject to thermal degradation, it is helpful to understand the heat transfer fluid’s condition using regular fluid analysis testing. In a typical system, the thermal fluid should be sampled yearly. 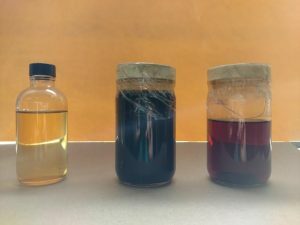 However, it is recommended to seek out a lab that is equipped to perform these important fluid analyses in a cost-effective manner as the analytical methods for heat transfer fluids are different from those applied to lubricating oils. Is the heat transfer fluid contaminated, oxidized or thermally degraded? Early warning of potential problems using a fluid monitoring program will allow the user to take corrective action, thus preventing an emergency situation resulting in unscheduled downtimes. Is it a fluid or system related issue? Should a problem occur, it should be determined if it is a thermal fluid or a heating system-related problem. Using accumulated data from regular sample testing can help to make this determination. However, the heat transfer system must be equipped with proper connections and sampling devices to facilitate direct sampling from the hot circulating loop. A fluid monitoring program tracks important fluid properties like total acid number (TAN), viscosity and flash point and compares them to properties of new fluid. Once the degradation pace is determined, it can be extrapolated to plan for the thermal fluid’s remaining useful life. Changing fluid before its condemning limits requires only draining and fluid replacement without flushing or system clean. Continuous use of oxidized or degraded fluid will lead to carbon deposits requiring system cleaning with an aromatic solvent or cleaning agent. A daily inspection of the heating system’s inlet and outlet temperatures and pressures at heat source allows users to prevent future system problems. A preventive fluid analysis is better than a cure. Before a system clean-up, it is important to analyze the system fluid to gauge the amount of cleaning required. Inadequate cleaning and topping up with new heat transfer fluid results in sludge and degraded fluid remaining in the system piping, thus shortening the life of the new fluid with cross contamination from the old fluid. The heat transfer system is the backbone of the production process. Therefore, it becomes necessary to develop and follow operational and mandatory guidelines to prevent unscheduled and excessive downtime, loss of production and loss of revenue. Unlike other central energy sources, a thermal fluid system does not call for routine maintenance like blowdown tanks or adding chemicals and that allows operators to take care of other items that require their attention. Simply looking at the heat transfer fluid will hint about its condition (e.g. if it is thick and black in color). In general, the first sign of problems to come is the heater’s inability to maintain temperature control at the heat user. This symptom is often compensated by the operator increasing the heater temperature that only adds to more rapid degradation of the fluid without correcting the problem. For all the above reasons thermal fluid analysis is important and should never be ignored. It can save you a lot of trouble in the end.